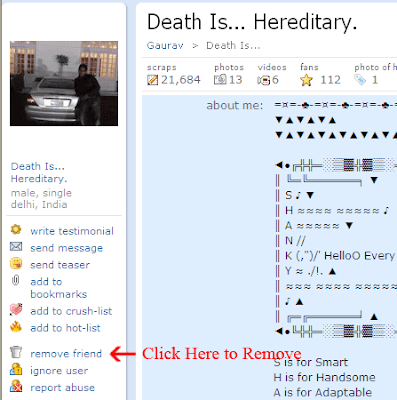 Deletion of friends on Orkut wasn't easy, You may have wished to delete friends who were added mistakenly [you may call them unwanted for sorts] or maybe someone changed profile. It was quite difficult to delete friends earlier, but now orkut has made it quite simple and easy to do so. Friend deletion has two main aspects, namely : Single Person removal and Mass friend removal. 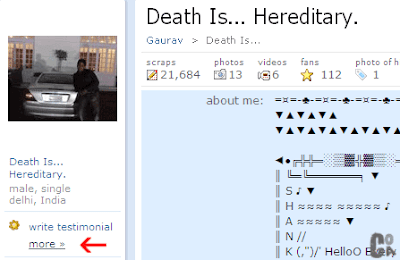 > On the profile page of the person, click on the more >> link beneath the profile picture. > To delete the person from the friend list, just select the remove friend link that comes over on clicking the more link. > Confirm Deletion and you are done. > Also you can select the ignore user to completely remove an annoying person and the person won't be able to send request or scrap to you at all. 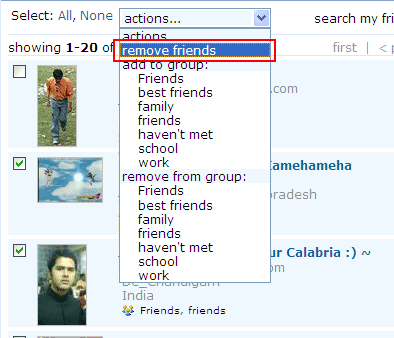 You can perform removal of friends from the Manage Friends page too, and you can delete multiple friends from herein. > Select the delete option from the actions menu, and you are done.